It may come as no surprise to many of you that at The Finest Bubble, we are fortunate enough to spend some of our time tasting and rating many different champagnes. However, we spend even more of our time researching tasting notes and ratings from the popular palates in the industry, discussing which champagnes the critics favour and comparing them with our preferences. We consequently make our purchase choices and consumer recommendations based upon correlations of what we, and the experts, consider to be outstanding. Thus, we spend a lot of time surrounded by champagne rating data and have consequently developed a good knowledge of the vintages, brands and cuvées that the well-known journalists, critics and authors in the wine trade prefer. Whilst their respective websites readily offer immense libraries of tasting notes and scores, few (if any) show analysis on the data which highlights their preferences. So, being the ultimate Champagne Geeks, we decided to conduct the analysis ourselves. Initially setting out to discover if what we consider the ‘top champagne vintages’ are rated accordingly, we decided to look at the four best vintages of the last twenty years – 1996, 1998, 2002 and 2004. Whilst there may have been better vintages since (2008 and 2012, for example – see our vintage guide), we chose these four as they are all old enough to have sufficient prestige cuvée releases and close enough in release to allow similar ageing, yet young enough to still be (somewhat) available on the market. Considering there are over 300 Champagne Houses and 19,000 growers, we also narrowed the brands down to include those in the ‘Union des Maisons de Champagne‘, or Grandes Marques – of which there are currently twenty-four. 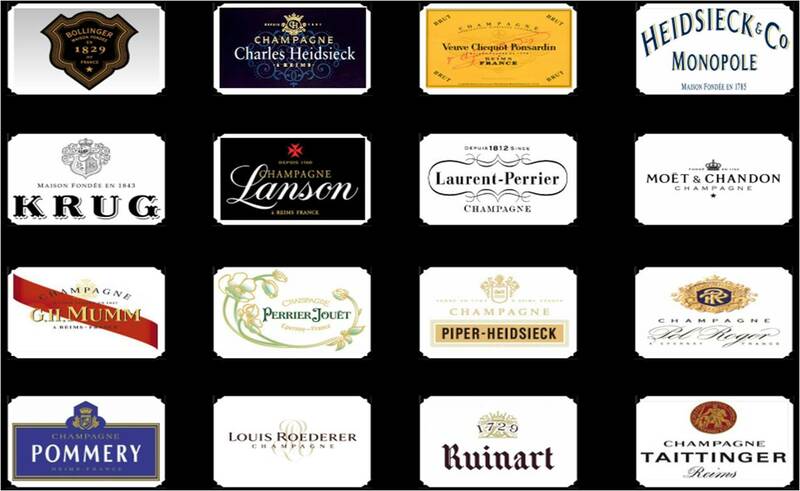 These are: Ayala, Billecart-Salmon, Bollinger, Canard-Duchêne, Deutz, Gosset, Charles Heidsieck, Heidsieck & Co Monopole, Krug, Lanson, Laurent-Perrier, Mercier, Moët & Chandon, GH Mumm, Joseph Perrier, Perrier-Jouët, Piper-Heidsieck, Pol Roger, Pommery, Louis Roederer, Ruinart, Salon, Taittinger and Veuve Clicquot. We then collected ratings and scores of all the Grandes Marques champagne cuvées from 1996, 1998, 2002 and 2004 from the top wine and champagne journalists, critics and authors including: Jancis Robinson MW, Essi Avellan MW, Richard Juhlin, Antonio Galloni and Wine Spectator (combined scores of Bruce Sanderson and Alison Napjus). Unfortunately, as Jancis scores champagnes on a 20-point scale (a trend we much prefer, but one that doesn’t seem to have caught on) and the others score out of 100, we couldn’t include her ratings in the averages, so we have presented her data separately. (For more on this, check out Steve De Long’s comparative score sheet, reviewing different scoring systems). Working on a spreadsheet with over 1,000 ratings for the top champagnes of the last twenty years, we set out to discover: 1) Which of the vintages has the highest average rating, 2) If there are any inter-critic favourite vintage differences, and 3) Which specific cuvées are consistently distinguished. 1) Which of the vintages has the highest rating? Unsurprisingly, this was the easiest to calculate. Averaging the scores for all two-hundred and thirty champagnes, ranging from House non-vintage to prestige cuvée, for each of the four vintage’s being assessed produced somewhat expected results. 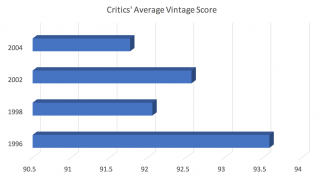 As the graph on the right shows, the exceptional 1996 vintage is the highest rated overall (93.6/100), closely followed by 2002 (92.6/100), with 1998 (92.1/100) and 2004 (91.8/100) receiving similar average ratings and ranking slightly lower. 2) Are there any inter-critic favourite vintage differences? The inter-critic data is slightly more complex to present. 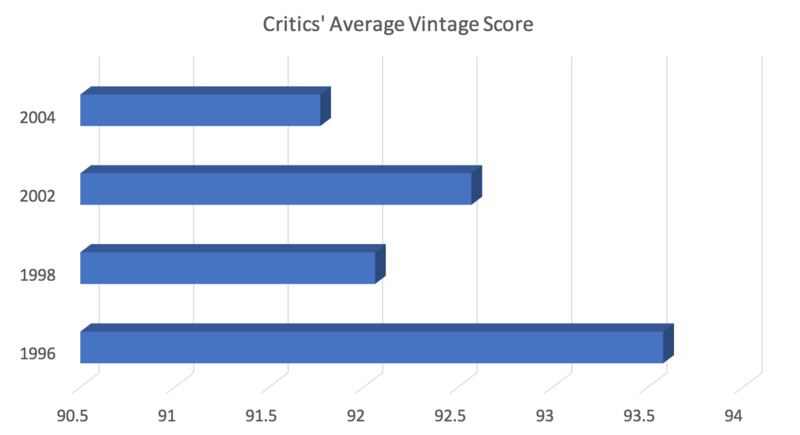 Whilst the across-critic average data above shows a clear trend towards favouring the older 1996 vintage over the younger 2004 vintage, not all journalists’ individual scores match the exact ranking above. As the graph below shows, all authors rate 1996 as their favoured vintage, except for Wine Spectator who prefer 2002. When it comes to second favourite vintage, the preferences diverge even further. 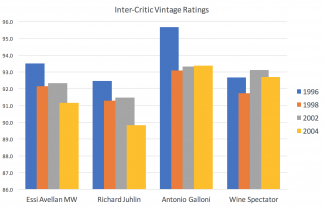 Whilst Jancis, Essi and Juhlin all rate 2002 as their second favourite after 1996, Galloni and Wine Spectator opt for 2004 (albeit marginally). This trend again continues, with the same three authors ranking 1998 third and 2004 fourth and Galloni and Wine Spectator breaking the pattern by rating 1998 as their least favoured champagne vintage. 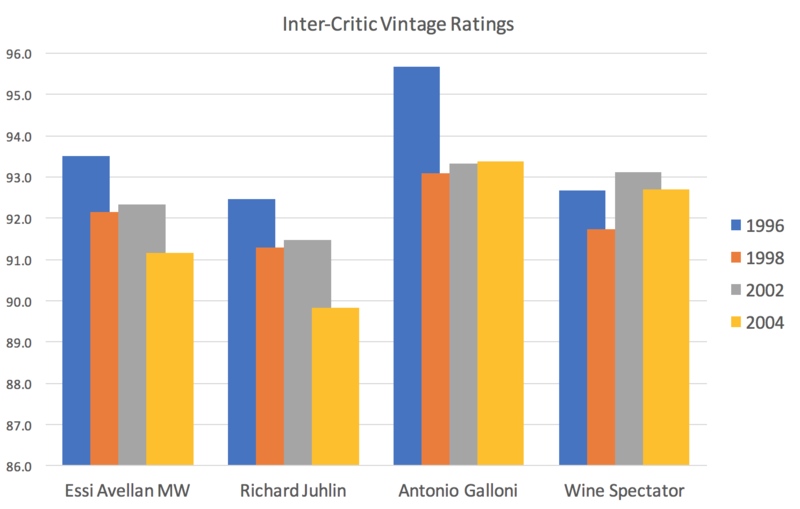 Summarily, the highest rated vintages do not follow an exact trend of preference among the trade’s most celebrated palates and individual taste has a noticeable impact. Interestingly, whilst discussing our research over dinner with Essi Avellan MW last week, she was surprised to discover the ranking of vintages that her scores display. When asked what she thought the results would show, she commented on her ever-increasing appreciation for the 2004 vintage (the year her ratings place the lowest). This goes to show how these results should be taken with a pinch of salt. Not only does personally favoured style have a large impact, but so too does the ageing of champagne. The prestige cuvées from 1996 have been ageing for some eight years longer than those from 2004, a process that will have a substantial effect on their style and quality. Only time will tell how further ageing will impact the scoring of the younger champagnes. Lastly, it is worth remembering that we are analysing the very best vintages of the last twenty years. Any differences shown are normally in the range of 1-2 points per 100, minimal variation that, if anything, shows the true prowess and ability of the Grandes Marques to produce champagnes of exceptional quality in vastly different growing seasons. 3) Which specific cuvées rank the highest? Finally, the table below shows the all-time highest ranking cuvées from the 1996, 1998, 2002 and 2004 vintages. As previously mentioned, Jancis’ 20-point scoring system doesn’t allow her ratings to contribute to the averages, so her Top 10 champagnes are provided on the right. Unsurprisingly, the same prestige brands consistently feature in both lists (namely Dom Pérignon, Krug and Louis Roederer), however it is interesting to note how both Top 10’s include cuvées from a variety of the 1996, 1998 and 2002 vintages, with only the group average Top 10 showing a slight predilection for cuvées from 1996. Interestingly, Jancis gave the stunning Dom Pérignon 2002 full marks, a 20/20 score that she has only bestowed upon four other champagnes (the youngest of which is from 1982!). However, whilst receiving a respectable 95.3/100 average from the group, this champagne doesn’t feature in their Top 10. Clearly Jancis has an affinity for the toasted, smoky and fruit-forward Dom Pérignon style, highlighting again the importance of individual taste. With that said, the only person who can confidently confirm which champagnes you are going to love most is you. 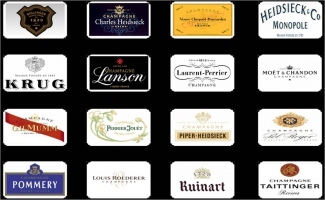 So if it’s time to start producing your own Top 10 Champagne league table then handily, almost all of the prestige champagnes below are available to buy from The Finest Bubble. Click on the champagne and follow the link to purchase a few bottles (cough, magnums) and commence your research!